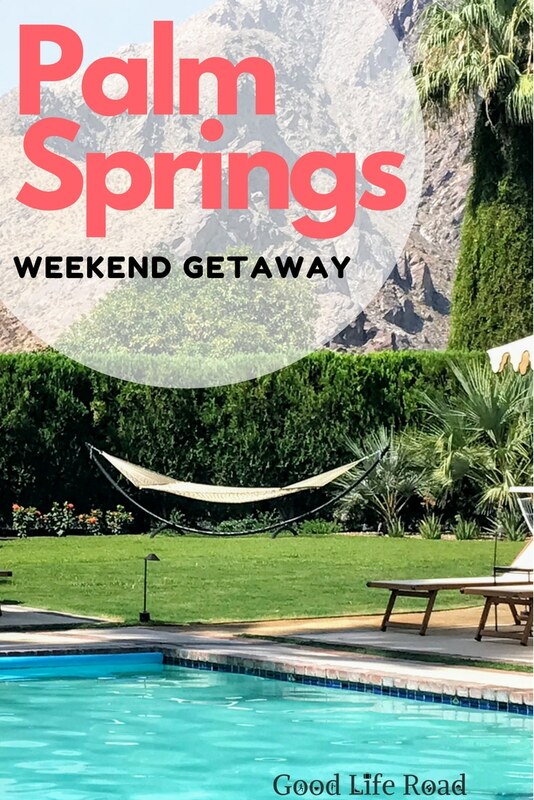 Last weekend we took a little road trip to Palm Springs. Emma, our daughter, is at sleep away camp for the first time and WE MISS HER! Is that silly? 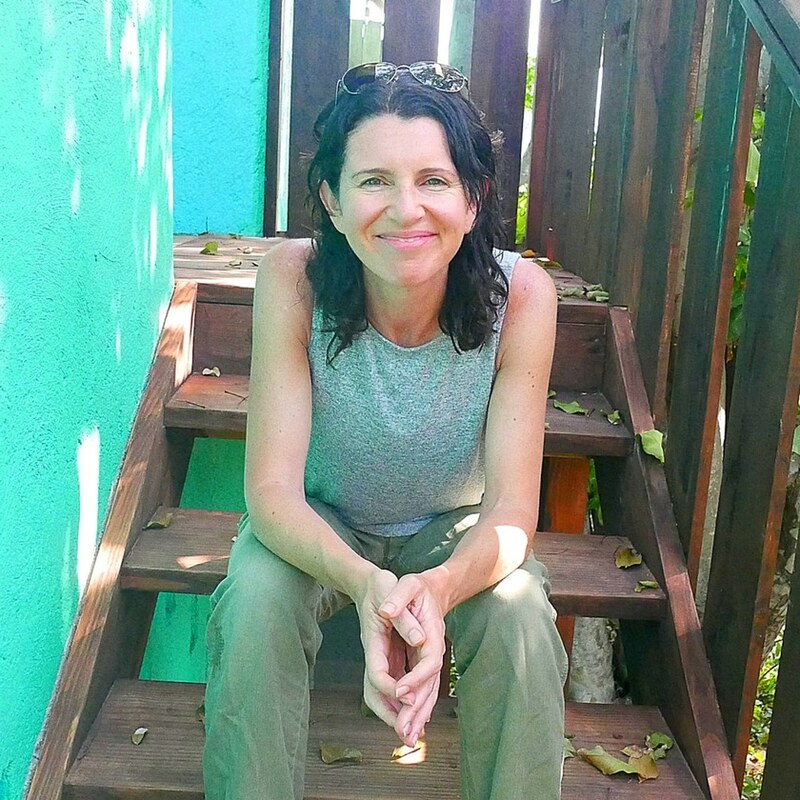 Are parents supposed to revel in all their free time while the kids are away? I don’t know, maybe we’re nerdy but that’s not us. 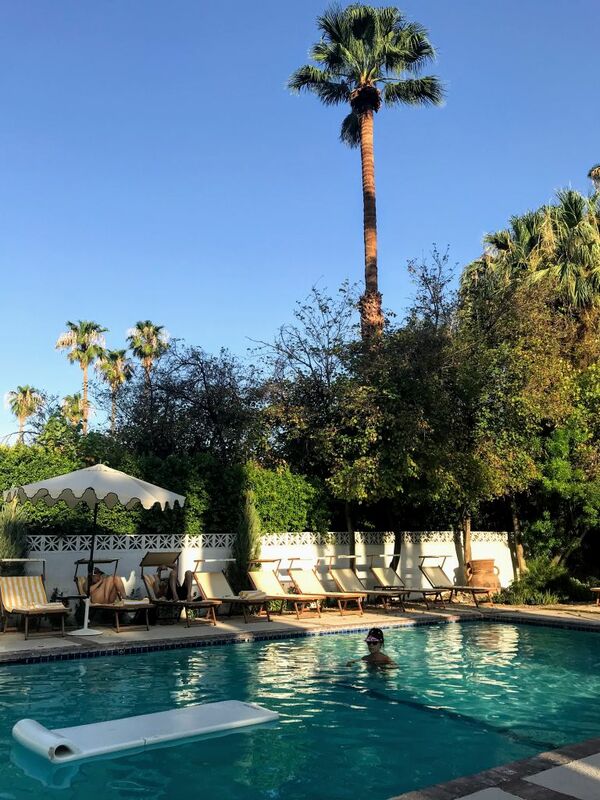 We needed a distraction, and hanging out in 110 degree weather while slurping down cocktails and floating in the pool sounded… um, perfect. So we booked two nights at the historic Ingleside Inn. 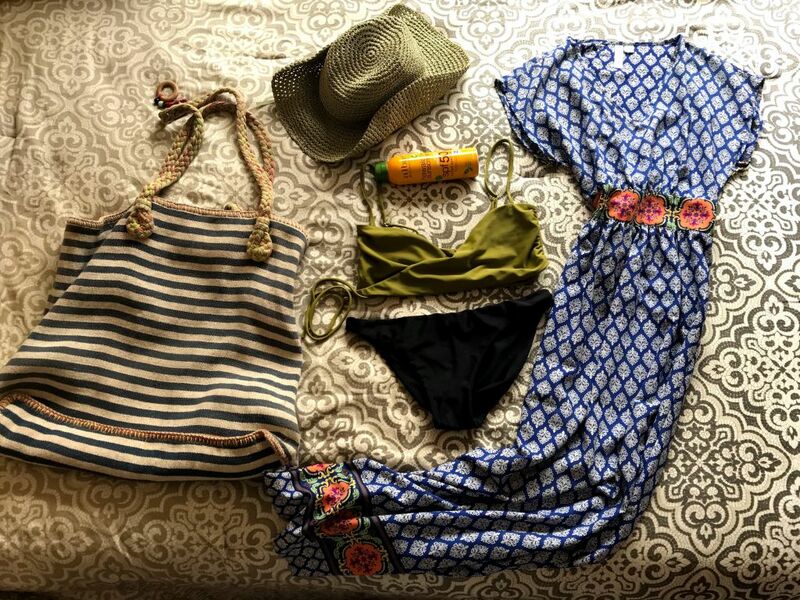 I threw my favorite pool dress, bathing suits, and a couple of outfits for tooling around this sweet dessert town into a bag, and we hit the road! 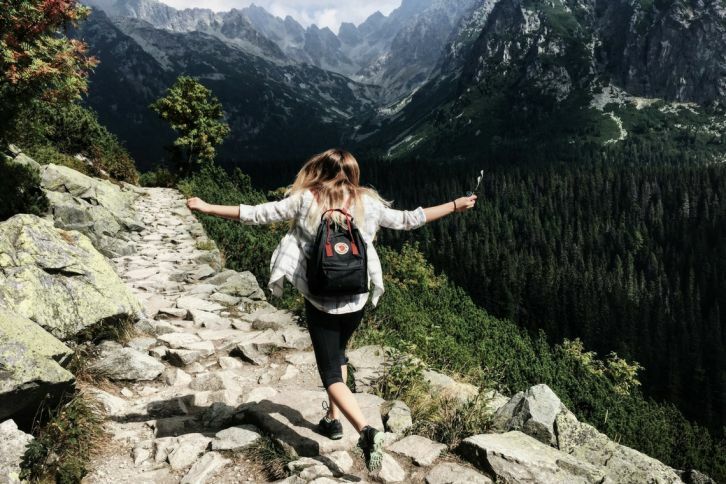 Key items to pack for a hot summer weekend getaway. 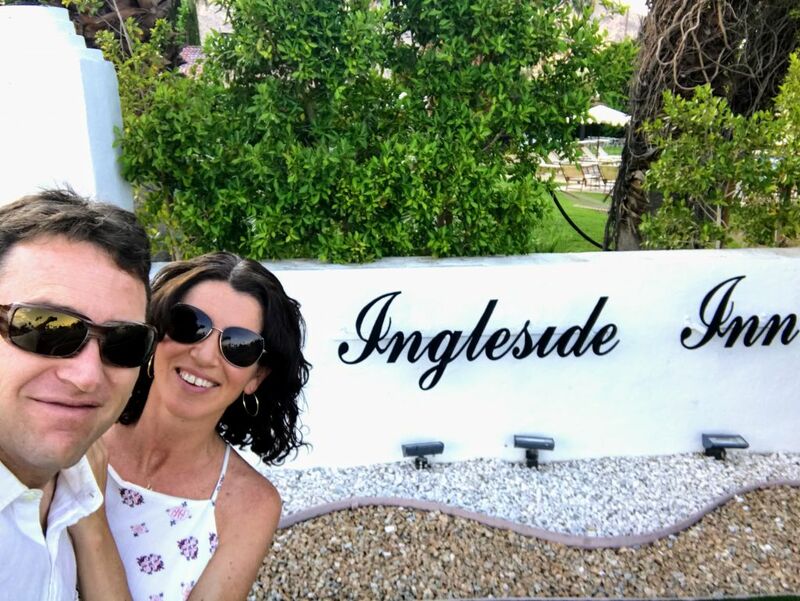 Derek and I arriving at the Ingleside Inn. The Ingleside was built in 1925 and then sold to a woman named Ruth Hardy in 1935. Ruth ran the Inn as her own personal club, with rules like you can only stay by invitation and all dinner guests had to be approved by Ruth herself. There’s nothing like the scent of exclusivity to rev some folks up, so it became the place to be. Guests included Howard Hughes, John Wayne, Clark Gable, Salvador Dali and Elizabeth Taylor. 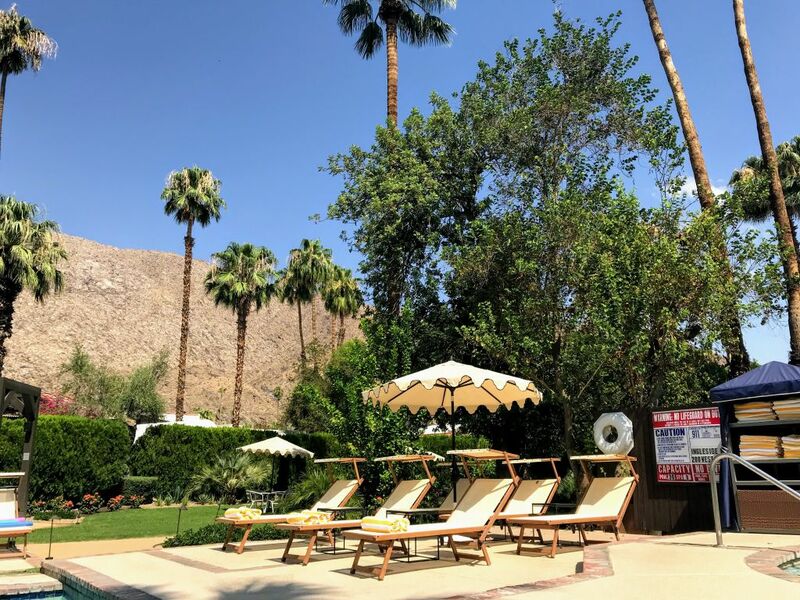 Eventually, in 1975, it was purchased by Melvyn Haber who refurbished the place and added a restaurant “Melvyn’s”, and until he passed away in 2016 (at the age of 80), he ran this swanky but low key dessert oasis with a kickin’ piano bar and restaurant. 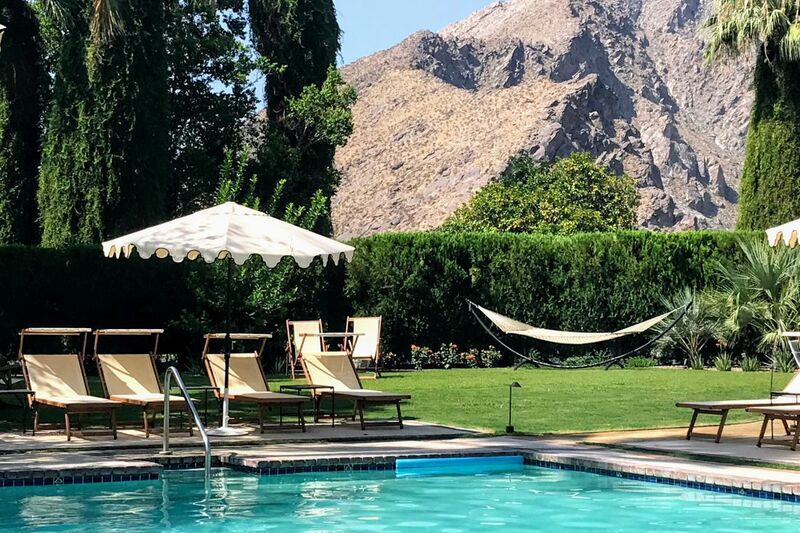 It’s clear they’re currently attempting to update the amenities in order to compete with the younger hip set of Palm Springs boutique hotels. Some of the improvements are nice, bikes added for complimentary use and a morning buffet for enjoying in your room or on the veranda of freshly baked pastries, yogurt, homemade granola and boiled eggs. In other ways they miss the mark though. A dj party at the pool on Saturday (luckily it wasn’t scheduled to start until 4pm). It’s not our style to venture to a classic old school hotel for a dj party. That said, the dj party was tastefully done, for hotel guests only, and many were enjoying it. 5 pm: it’s still 105 degrees out.. let’s hit the pool! 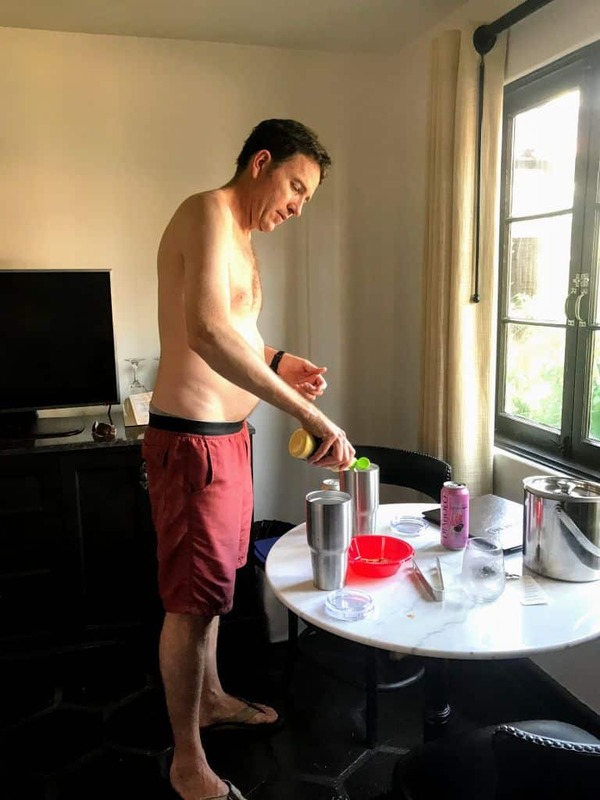 Hot tip – secret stash – make delish cocktails in insulated to-go mugs to bring out to the pool. Rooms have a small refrigerator. Poolside as the sun sets and it’s still 105 degrees! 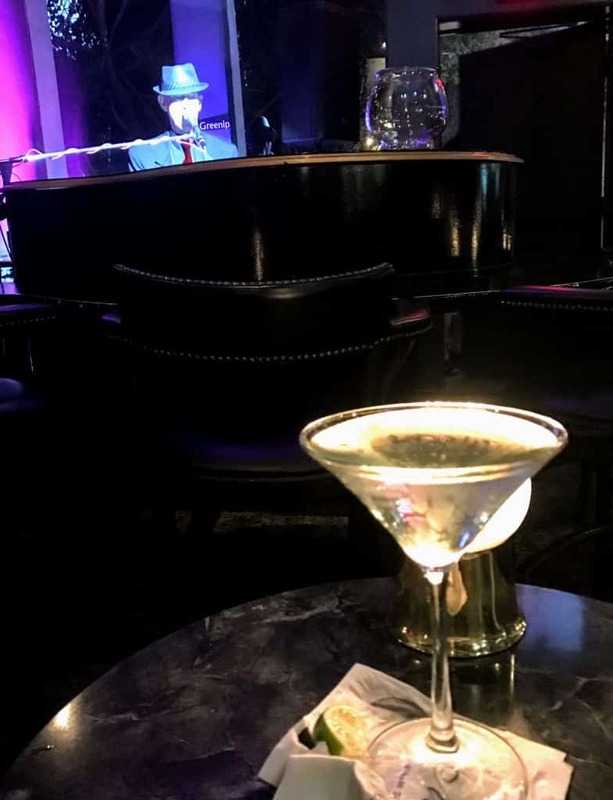 The piano player started at 8pm playing classics from the 50’s through the 70’s Frank Sinatra, the Beatles…We split a Caesar salad and a Melvyn’s Burger With the world’s strongest gin gimlet. Strong cocktails and good food in a classic piano bar setting at Melvyn’s, which is located at the Ingleside. 9:30 pm: take a Lyft downtown (only 5 minute drive) to Tonga Hut for some amazing Mai Tai’s and coconut shrimp. They also have loads of old-school games out so you can get competitive over Connect Four. 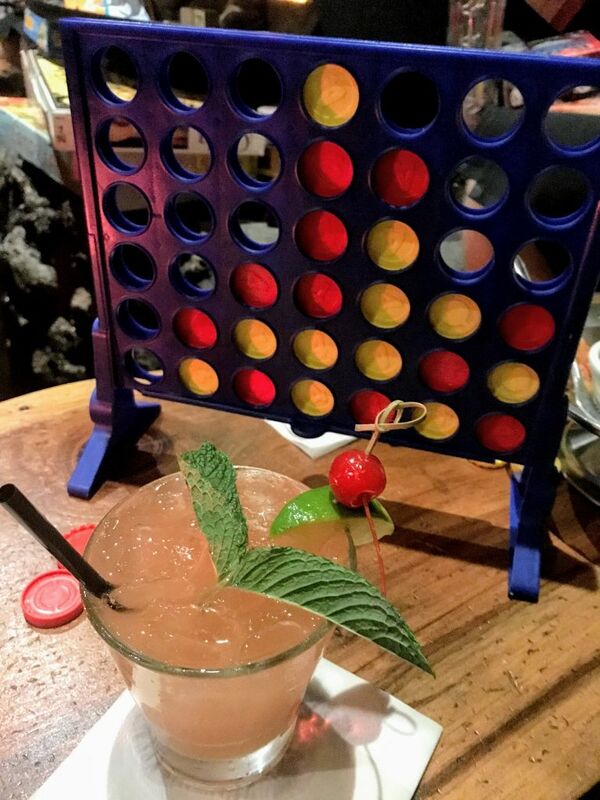 Tonga Hut has a lively atmosphere, good food and drinks., and a fun selection of games, including connect four! 8 am: Start the morning with breakfast snacks from the complimentary buffet for enjoying in your room or on the veranda: freshly baked pastries, yogurt, homemade granola and hard-boiled eggs. 9:30 am -2:30 pm: Go to the pool – swim, laze, read, order food, order drinks repeat. Beautiful view of the pool-side and gardens, with a touch of the hot tub (rarely used in the summer) to the far right. Floating in the (now) crystal clear and refreshing pool. 5 pm: Freshly showered and dressed we head off to our favorite restaurant The Tropicale for dinner and drinks on the patio. 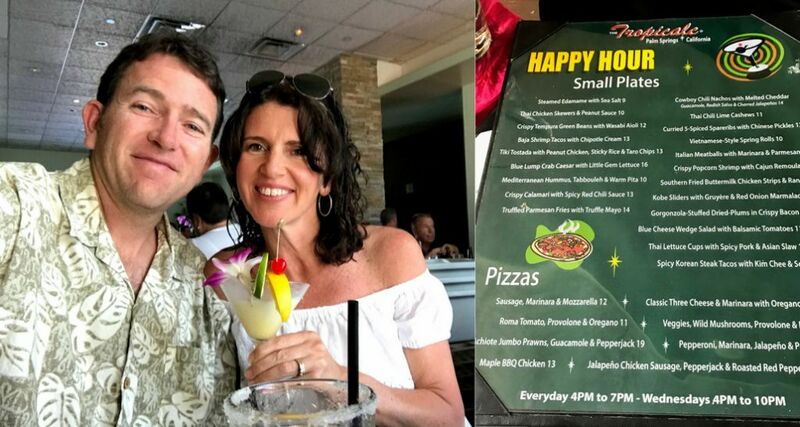 Tasty food & beverages, and wonderful staff & atmosphere make Tropicale our favorite restaurant in Palm Springs. 7:30 am: early morning bike ride, while the weather is still cool enough, over to breakfast at Elmer’s for their amazing omelettes, biscuits and pancakes. Elmer’s is popular so going early, if you can, is a good idea. 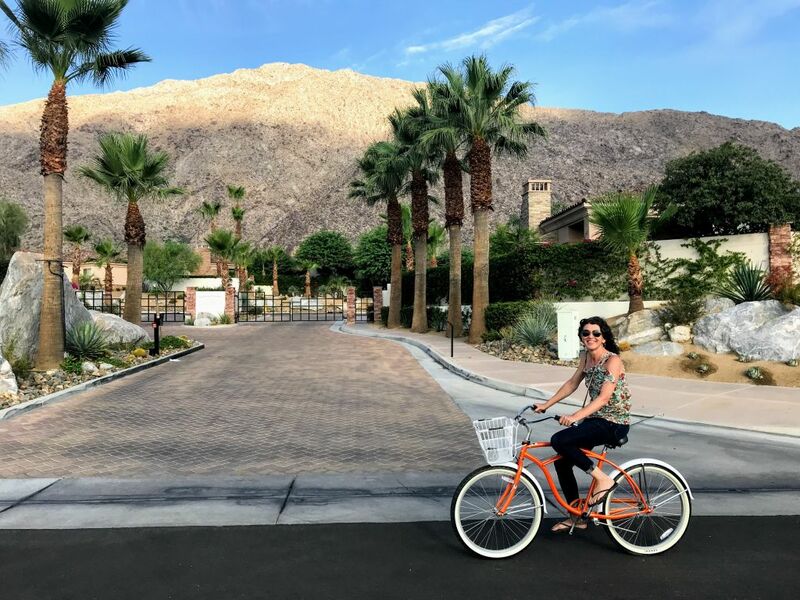 A bike ride through the neighborhoods of Palm springs is a great way to experience some of the beautiful and iconic mid-century architecture. A beautiful early morning bike ride to breakfast using free hotel bikes. 12 pm: Check out of hotel and start the 2 hour road trip (without traffic) home. 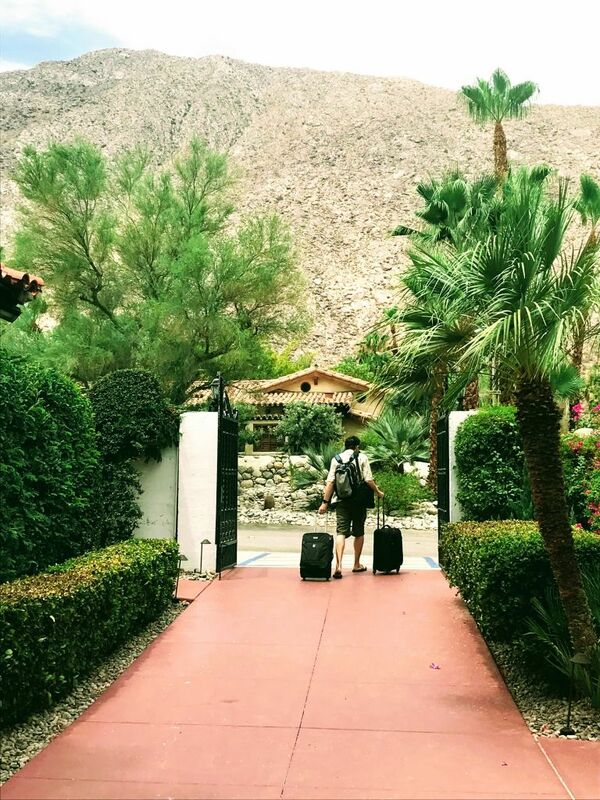 Bye bye Palm Springs! We look forward to the next time!